Our best-selling field guide has been completely reorganized by flower colors for easier use—every wildflower is presented with a large color photo and an identifying description. With more than 175,000 copies sold, Texas Wildflowers has established itself as the go-to guide for identifying the state’s roadside flowers. 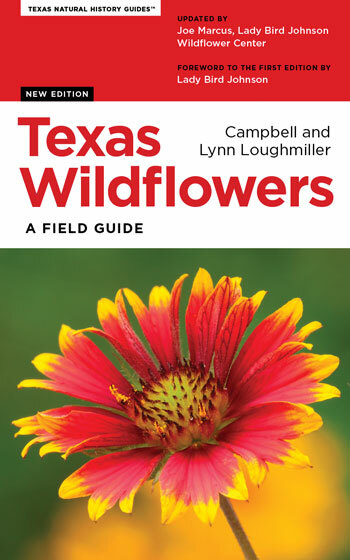 This new edition has been completely reorganized by flower colors (and within each color section, by flowering season) to make it even easier to identify the flowers you see as you travel through Texas. Every wildflower is illustrated with a beautiful full-color photograph—over 250 of which are new to this edition. All of the descriptive identifying information is presented in a consistent format—common and botanical names, plant and leaves, flowers and fruit, flowering season, habitat and range, and notes. The Loughmillers were pioneering conservationists who coauthored four books. Campbell Loughmiller served as president of the Texas chapter of the Nature Conservancy and as a board member of the Texas Conservation Council. Marcus is the program coordinator for the Native Plant Information Network at the Lady Bird Johnson Wildflower Center.